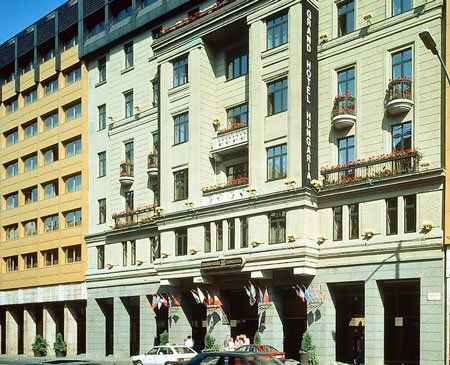 Hotel Hungaria City Center, the largest hotel in Hungary has been serving our guests since 1915. The hotel is located in the heart of Budapest, along the main traffic line leading to Erzsébet bridge and dividing the city into two parts. 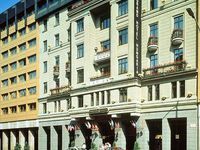 Hotel Hungaria City Center has excellent public transport connections (metro station nearby, bus stop just at the entrance) ensuring easy access to the most important parts of the city and the countryside. All 468 air-conditioned rooms are equipped with TV with satellite channels, Pay-TV, direct-dial telephone, WIFI Internet access, mini fridge (minibar on request), radio, hairdryer and wake-up service/alarm clock. Rooms for smokers or non smokers and rooms with a safety deposit box are also available. You can enjoy delicacies from the excellent, traditional Hungarian and International cuisine in our two Restaurants the elegant Beatrix Restaurant and the unique styled Fiaker Restaurant. Recalling the atmosphere of the turn of the 20th century, the Fiaker Brasserie is an ideal place to enjoy a nice cold beer with salty bites while having a rest after a busy day or shopping in the downtown or having a chat with friends. Lobby Bar in the hotel lounge offers a wide selection of fresh, homemade delicious cakes, aromatic coffee, different kinds of alcoholic and non-alcoholic beverages. Guarded parking for private cars in the hotel garage and a parking site for buses close to the hotel serve your convenience. A separate Check-In Room ensures a fast and smooth check-in process for the groups. Relax in our Beauty and Health Centre where sauna, medicinal massage, hairdresser and beauty parlour serve your recreation. Souvenir shops, laundry servoce, room service, rent a car service, florist's and business services ensure a pleasant stay for you. • Breakfast is not included in room rates. It is available at 10 EUR per person. • Garage is available for guests at 16 EUR per car per day. A Credit Card number is required to confirm and guarantee your reservation. Your credit card will not be charged in advance. Public rates include VAT (18%) and local tax (4% of the accommodation cost), but not buffet breakfast. Cancellation Policy: No cancellation charge if the reservation is cancelled prior to 4:00 PM (hotel local time) at the day of arrival. In case of late cancellation and no show you will be charged with one night's room rate. A Credit Card number is required to confirm and guarantee your reservation. Your credit card will not be charged in advance. Public rates include VAT (18%), local tax (4% of the accommodation cost), and buffet breakfast. Cancellation Policy: No cancellation charge if the reservation is cancelled prior to 4:00 PM (hotel local time) at the day of arrival. In case of late cancellation and no show you will be charged with one night's room rate. Stay minimum 3 nights and save 20 %. Stay minimum 3 night and save 20 %.